The number of organised visits to outstanding natural features almost tripled in the 1992-2008 period, and in 2008, 882.000 tickets were sold. By far the most visited natural feature is the Postojna Cave. The indicator shows the number of tourists visiting selected outstanding natural features within a calendar year. The selected outstanding natural features are tourist attractions with natural beauties according to the definition by the Statistical Office of the Republic of Slovenia and are included in continuous monitoring of tourist visits. - Protection of areas that are indispensable for maintaining biodiversity, where numerous and various measures must be ensured, and actions and activities must be directed (i.e. tourism and recreation in particular). The indicator shows development in the tourist popularity for selected outstanding natural features in Slovenia. Visits and number of entrance tickets for visits to outstanding natural features also depend on their presentation and organisation. 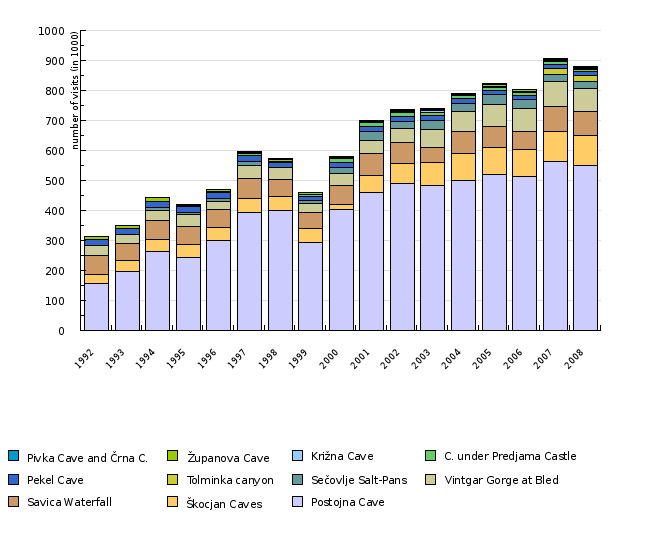 In the period of 1992-2008, the total number of organised visits almost tripled, and the number of sites arranged by responsible operators for tourist visits also increased, thus enabling safe and guided experiences of outstanding natural features and, at the same time, protection from excessive loading. This is especially important in sensitive habitats such as karst caves. By granting a concession to the operators of the Postojna Cave and the Sečovlje Salina in 2002, a step forward in the realisation of the National Environmental Action Programme envisaging the introduction of assigning concessions for tourist consumption of natural resources has also been made. In 2005, 822.000 tickets to natural features were sold in Slovenia and in 2007, the sale of tickets increased to 907.000, while a slight decrease was observed in 2008. By far the most visited natural feature is the Postojna Cave. Source database or source: The source of data includes notices in publications, Results of surveys, Statistical information, Results of surveys, Visits to some Important Tourist Sites, 661/1996, 681/1997, 708/1998, 736/1999, 738/2000, 745/2001, 771/2002, 787/2002, Statistical Office of the RS. Statistical Information, 21 Tourism, Visits to Selected Tourist Sites, Museums and Galleries, Swimming Facilities, Casinos and Gaming Salons, and Number of Days of Operation, Slovenia, 4th quarter, 148/2004, 73/2005, 47/2006, 25/2007, 16/2008, 18/2009, Statistical Office of the RS. Methodology and frequency of data collection for the indicator: By conducting statistical surveys, the Statistical Office of the RS monitors visits to selected outstanding natural, cultural and historical tourist sites, swimming facilities and registered casinos and gaming salons in Slovenia; the Office monitors the number of visitors and the movement (dynamics) of visits. The data on the number of visitors is communicated quarterly to the Statistical Office of the Republic of Slovenia by managers of tourist establishments – natural, cultural and historical tourist sites, swimming facilities, casinos and gaming salons. Data processing methodology: The number of tickets sold serves as a basis for communicating the data on the number of visitors. The number of visitors to special events outside the regular activities of a tourist establishment (i.e. musical evening in a museum) and the number of participants in regular sports training in swimming facilities have not been included in the survey. - Advantages and disadvantages of the indicator: The indicator presents only the selected natural features. - Decree on the Concession for Utilisation of Valuable Natural Features of the Postojna and Predjama Cave Systems (Official Gazette of the RS No. 77/02). - Decree on the Concession for the Use of a Valuable Natural Feature: Sečoveljske soline and on the Concession for the Management of Sečoveljske soline Landscape Park (Official Gazette of the RS, No. 11/02).